Its main exports are electronic components, plastic bags, appael, and hot peppers. Its major imports include machinery and transportation equipment, foodstuffs, and manufactured goods. Located in the Caribbean, Montserrat is an island nation. It has a 40.00 km coastline. The largest city and Montserrat’s de facto capital is Brades. It became the capital in 1998 after the former capital Plymouth suffered extensive destruction following an eruption from the Soufriere Hills volcano in 1995. Although the decision to make Brades capital at the time was temporary, it has remained capital since. However, Little Bay will be the new capital after completion of its construction. Out of Montserrat’s population of 5,177, Brades is home to 1,000 people, with a population growth rate of 0.52%. The most popular tourist attractions in the capital include Centre Hill, Hilltop Coffee House, Little Bay Beach, Montserrat National Trust’s botanical garden, Bat Cave, Montserrat Volcano Observatory, and Jack Boy Hill. Brades has a tropical climate with a significant amount of rainfall all through the year. The cold and dry periods start in January through to April, while the hot and rainy periods begin in June to November. The driest month is February while the wettest month is August or October. Montserrat is a North American country covering 102.00 km2. and about 27 times smaller than Rhode Island. Its geographic coordinates are 16 45 N, 62 12 W and Plymouth is the capital city. The island was named by Christopher Columbus after the Benedictine abbey Santa Maria de Montserrat. Its ISO code is MS.
Montserrat has a mean elevation of 0 m above sea level. It has a tropical climate with little to no temperature variation. its terrain consists of a volcanic islands, with some small coastal lowlands. 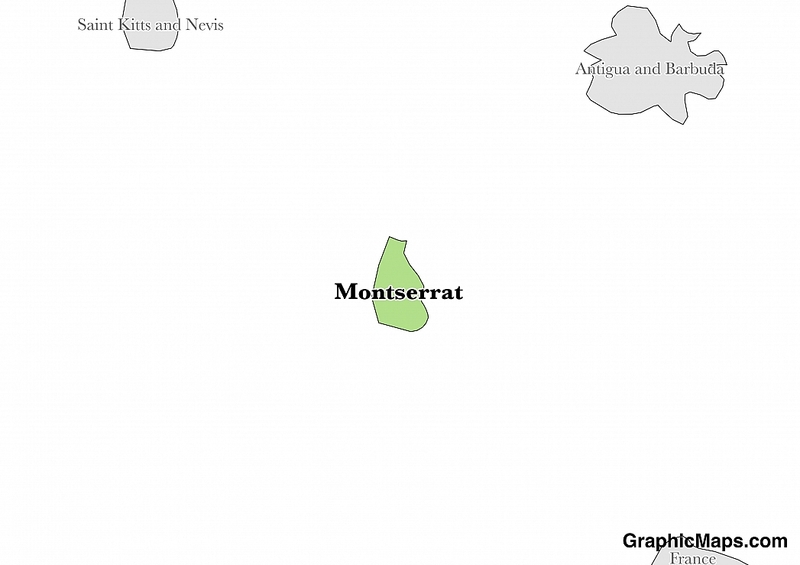 Montserrat has a population of 5,267 making it the 227th largest in the world. Only the northern section of the island is populated. English is the official language. The major ethnic group reported is African/black. The majority of the population is Protestant Christian. Montserrat is a British Overseas Territory and has two main languages: English and Montserrat Creole. The latter is a dialect of the Leeward Caribbean Creole English which derives a lot of its vocabulary from both English and African languages. The dialing code for the country is -663. A governor is chosen by the British monarch to act as its representative in Montserrat. The government’s head is a Premier who is chosen by the governor from the nine elected members of the Legislative Assembly. The legislative assembly was previously called the Legislative Council, and the name was changed after promulgation of the 2011 constitution. The system of government is a parliamentary democracy and constitutional monarchy while the parliamentary system is unicameral. Besides the nine elected officials of the Legislative Assembly, there is the financial secretary and the attorney general, who are ex-officio members, therefore making up a total of eleven members. The government operates at Brades, which is the capital of the Island. Since 1951, eligible voters should have attained the age of 18 years and above. Elections for people in the Legislative Assembly are carried out after five years. Factoring in Purchasing Power Parity, Montserrat's GDP is $43,780,000.00 (USD) with $8,500.00 (USD) per capita. This makes it the 223rd largest economy and its citizens the 142nd richest in the world. The currency of Montserrat is the Dollar (XCD). The flag of Montserrat is comprised of blue, the British flag and a coat of arms. The blue color covers the whole of the flag with the top left quadrant having the UK flag. The flag design is based on the Union Jack of the UK. The coat of arms is made up of a woman (Erin) in a green dress a holding a harp on the left hand and a huge cross on the right hand. The blue color of the flag symbolizes awareness, righteousness, trustworthiness, and determination. The Erin on the coat of arms stands for the independence of Ireland while the cross stands for Christianity. The only difference between the current and previous flag is the disc badge. The disc badge was used during the reign of Governor Sir Benjamin Pine. He is the one who designed the disc badge that was used until 1958. Montserrat has had only one flag design with changes only on the coat of arms. The current flag of Montserrat has been in its original form up until 1999. In 1999 the Ensign was enlarged so that the flag could be easily recognized. The enlargement is the only change on the flag since 1909.